What I like most about eating real food is that it has impacted other aspects of my life. Leading me to the decision to write about the fact that paleo is not just about the food. It has made me a more mindful person when it comes to the lifestyle choices I make, the importance of my food sources and the people I listen to. Lifestyle adjustments are important. You must make a conscious effort to lead a life with as little stress as possible. This means learning to say no. I am a giver, fixer and problem solver. In years past I would over extend myself (constantly being busy) thinking it was a good thing. It’s not. I thought volunteering for booster clubs, helping friends in crisis on top of going to college and raising my family was just the way it had to be. I’ve learned in middle age that other people (including employers) not planning well in their own lives is not my problem. I’ve learned that taking care of myself first helps me be better for the people I love the most. For me what is important is my family and friends and being able to spend quality time with them. Material things are not what nutures our spirit. What matters are the relationships we build. This “paleo” lifestyle has taught me to expend energy in a way that fosters relationships. Group dinners and gym potlucks, coffee or workout dates with friends are examples. Reach out to those around you and plan events that improve your health and help you connect with your community. Where your food comes from matters. I do my best to buy local organic vegetables, pastured eggs and grass-fed meat. I grow what I can during the summer in my own garden which provides me with healthy doses of Vitamin D and joy from digging in the dirt. If you don’t have your own room to garden check out community gardens in your town. Some schools or local farms have gardens that will exchange produce for weeding time. It is a way to connect to the land and teach yourself and your children about where food comes from. It also offers the opportunity to try new fruits and vegetables in the real food recipes you are making. If gardening is out of the question, find your local farmers market and make it a weekly excursion. What inputs you allow into your head are important. We are saturated in media these days and it is vital to find sources rooted in solid science when it comes to our health. I have read voraciously over the past six years trying to expand my knowledge of nutrition and have listened to many health lectures that were way over my head. To be honest I rely on people with a background in science to decipher it for me. Chris Kresser, Sarah Ballantyne, Aglaée Jacob and Robb Wolf are people I trust to give me honest information, because they have scientific backgrounds and understand how to look at the efficacy of a scientific study. They also will adjust their nutritional and lifestyle advice based on current research. Be a skeptic when it comes to nutritional advice. Educate yourself and never assume what you are hearing or reading is fact, because every study can be funded by someone with their own agenda or a desire to protect their money. Ideal health comes from doing your own research and determining what your optimal diet is through elimination and reintroduction of foods. Be selfish when it comes to your wellbeing, because in the end it makes you healthier and happier for the people that matter the most. I cooked for 6 hours today. I’ve been slacking the past few weeks, cooking the old standbys (meatloaf, stew, hamburgers, salmon on the Traeger) and decided to pull out a few of my cookbooks and try some new recipes. Man, I love Sarah Fragoso. 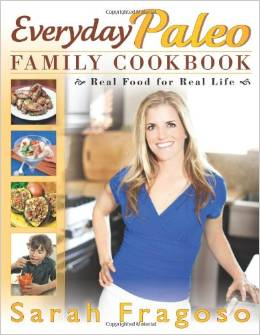 I have three of her Everyday Paleo cookbooks. I flipped through one of them and settled on meatballs with spaghetti squash, sloppy Joes, BBQ sauce and stuffing, compiled my shopping list and hit the store. In addition to those I made some BBQ chicken thighs and beer can chicken. Yes, I know beer is not paleo, but I had a can left over someone left at our house and decided to use it. (I don’t eat chicken so I don’t have to worry about the gluten exposure.) Long story short I cooked a lot of food. I’d post pictures, but I’m exhausted. However my fridge and freezer are stocked for at least the next week and I only have four things to cook tomorrow. The hubby has eaten 6 huge meatballs and 1/3 of the chicken and now he’s asking for cookies. Too bad. 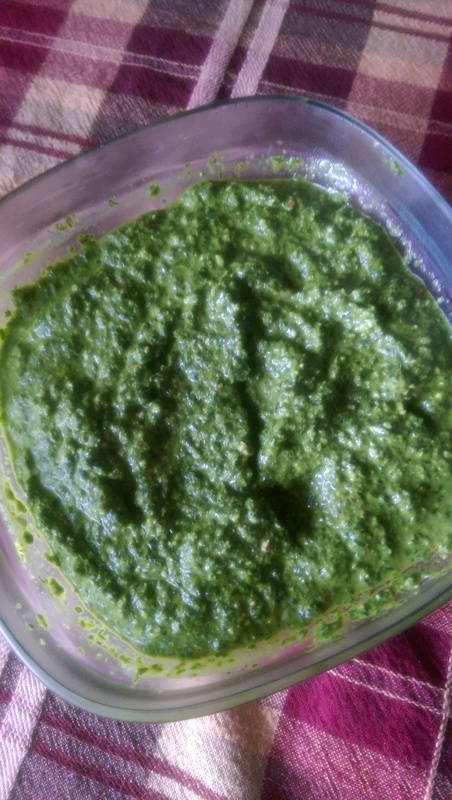 Basil (I used two small bunches, probably two cups loosely packed), 1 bunch cilantro and 1 bunch spinach. Remove stems, put the leaves from each bunch in the food processor. Pulse a few times. Add juice of a lemon, 1/4 -1/2 cup olive oil, 1/2 tsp of salt, 3 garlic cloves, 1/4 cup pine nuts, 1/4 pecans. Mix in the food processor, scraping the sides as needed until well blended.